Inflammatory Bowel Disease (IBD) in dogs and cats is a broad term that covers various chronic conditions of the gastrointestinal system that tends to affect the middle aged and older. Inflammation of the lining of the stomach, small intestine, and/or colon is thought to be an abnormal response by their immune system, a hypersensitivity to gut bacteria, or even food allergens. Symptoms include chronic (recurrent) vomiting and/or diarrhea, weight loss, lethargy, fatigue, abdominal pain and gas. 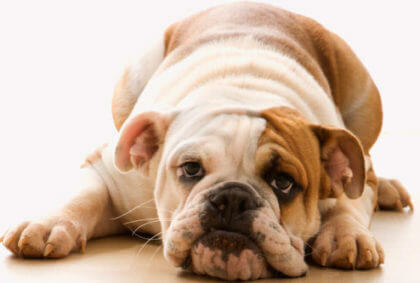 You may hear gurgling or rumbling in the pet’s abdomen and may even see blood in the stool. Watch for any straining while defecating. Cat breeds genetically predisposed to IBD are Purebred and Siamese. Dog breeds genetically predisposed to IBD are the Basenji, Boxer, French Bulldog, German Shepherd, Irish Setter, Rottweiler and Shar-pei; however, susceptible to any dog breed. Inflammatory bowel disease is usually treated with immunosuppressive and antibiotic medications. Intravenous fluid may be needed if bouts of severe vomiting or diarrhea has caused dehydration. It may be recommended that your pet be switched to a hypoallergenic diet (which is available at Safari). In most cases, this treatment method will not “cure” IBD, but will help by stabilizing body weight, alleviating gastrointestinal symptoms and reducing the immune system’s response. However, even after complete recovery, relapses are common. Follow-up visits to your vet and ongoing drug intervention will likely be required. Stem cells halt the attack on the gastrointestinal system by “resetting” the immune system. With IBD, the immune system wants to attack the inflammation, but the stem cells sort of put themselves in front of the gastrointestinal walls so that they are attacked, and not the gastrointestinal walls. Meanwhile, the inflammation has a chance to subside, the attack stops, and things return to normal. This means that your dog can be treated intravenously with stem cells and be resolved of the issue, rather than just treating the symptoms with medication.